The US housing market has rebounded from one its deepest declines in history. The median sales price of new homes in the country dipped to $205,100 in 2009 according to Census Bureau data. Eight years later, that figure is $310,800, an increase of 51.53 percent. In the aftermath of one of the worst recessions in history, the country’s housing market continues to reward long-term investors with handsome profits. Experts believe that the uptrend will continue based on robust housing market fundamentals. If you’re looking to ride the trend, you can maximize your returns by investing in states whose housing markets have high growth potential. We compiled publicly available data from sources such as the Bureau of Labor Statistics, Census Bureau, and National Association of Realtors. We then analyzed the data for each state to put together a definitive ranking of the best states to buy an investment property. Read on to see which states made the top 10. We also list our definitive ranking of all 50 states below. 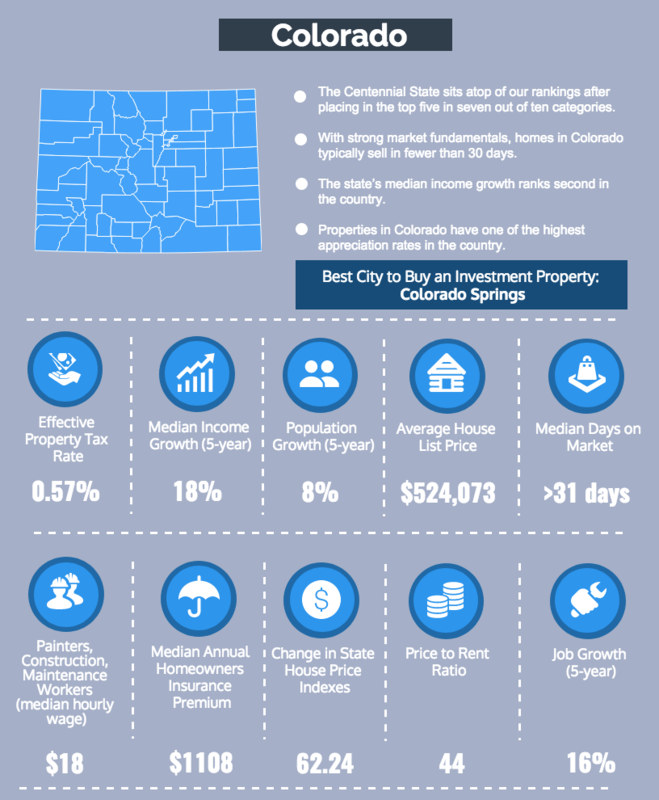 Colorado sits atop of our ranking of best states to buy an investment property. The Centennial State ranked in the top five in seven out of ten categories. In Colorado, homes on the market usually sell in fewer than 30 days. Colorado property taxes are one of the lowest in the country at 0.57 percent, coming in third. The state ranks second in median income growth, with a growth rate of 18.25 percent over the last five years. Properties in Colorado also have the fourth highest appreciation rate with a House Price Index (HPI) of 62.24. No other state posted stellar rankings in as many categories as Colorado, making it a great choice for long-term property investors. Home prices in Colorado Springs remain affordable while income and job growth continue to rise. The median home price in the city is roughly $175,000 less than in the state’s capital, which means there’s room for untapped potential. Its median household income of $61,190 is significantly higher than the national median household income of $56,516. Moreover, the city posted 2.9 percent job growth from 2015 – 2016, boosted by a highly educated workforce. 36.5 percent of residents in Colorado Springs are college degree holders. For investors, the combination of low prices and strong market fundamentals in Colorado Springs is attractive. 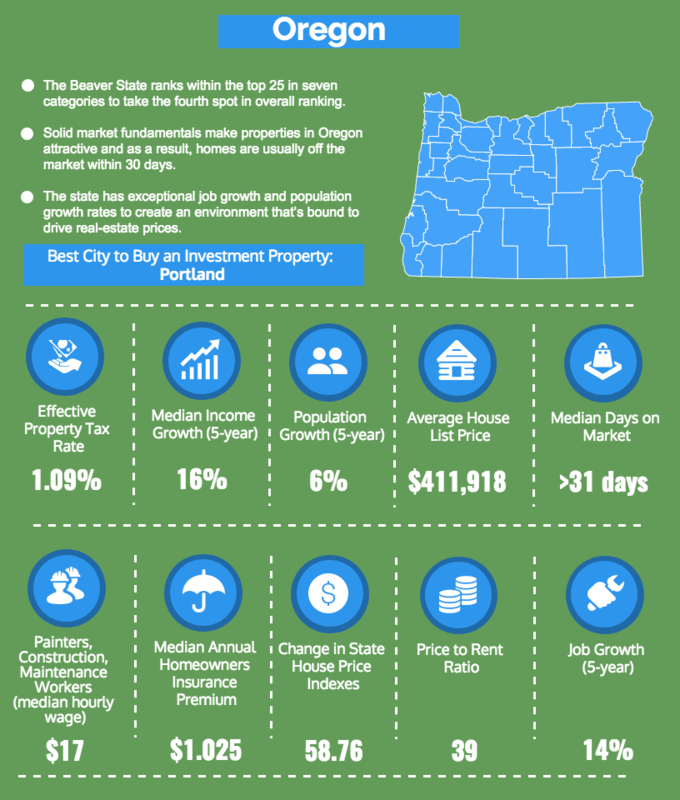 Second on our best states to buy an investment property is the Beehive State. Utah ranks within the top ten in five categories, led by strong showings in median days on the market, job growth, and population growth. Just like Colorado, listed homes in the state are typically sold in under a month. Moreover, jobs in Utah increased by 16.33 percent over a period of five years. The state also enjoys the benefit of a growing population to rank third in the category. Dramatic increase in job growth indicates healthy economic activity. Combine that with a booming population, and you get an environment that’s bound to drive real estate prices in the long-term. Jobs and household income in Logan are on the up and up. Despite the indication of strength in market fundamentals, home prices remain affordable. The average cost of housing in the city is roughly $80,000 less than in the state’s capital. While we put a premium on high average listing price, there’s an opportunity to generate more profits in laggard markets with robust fundamentals. Partly thanks to a highly educated labor force, the number of jobs in Logan is expected to grow by 3 percent in the next few years. Also, household income has risen by 3.2 percent in a span of one year. The combination of an educated workforce and rising jobs and household income might drive Logan’s housing market up in the coming years. The Gem State finishes third on the podium spurred by top ten rankings in five significant categories. With a robust housing market, listed properties in Idaho generally sell within a month. The state offers the third lowest labor costs in the country, with a median hourly rate of $15.49 for construction workers, painters, and other people who help with renovations. In addition, houses in Idaho enjoy one of the highest appreciation rates. The state’s five-year HPI of 49.37 is good enough to finish eighth. Home price in the state’s capital is in a strong uptrend. Zillow reports that home prices in Boise have risen by 8.8 percent in the past year. Even though the city’s home value of $216,100 is already at an all-time high, experts predict that prices will continue to climb, by roughly 4 percent in the next year. Oregon ranks within the top 25 in seven categories to take the fourth spot in our rankings. Homes in the Beaver State are usually off the market within 30 days, making it attractive to investors. Furthermore, the median income in the state has grown by 16.30 percent in half a decade. Also, Oregon’s five-year HPI of 58.76 is the sixth highest in the nation, which indicates that properties in Oregon are some of the fastest to appreciate in the country. The housing market in the state’s largest city is a buyer’s market according to Zillow, which means you’ll have a ready pool of buyers when your house goes on the market. Median home value is $419,100, and experts forecast a growth of 4.3 percent growth by next year. Portland’s fundamentals look strong as well. Unemployment is down at 3.1 percent, while household income and jobs have risen by 2.8 percent and 3.3 percent respectively. Taking the fifth spot is the Big Bend State, bolstered by good performances in time on market, job growth, and labor costs. Like all states in the top ten, listed houses in Tennessee are typically sold in 30 days. With a median hourly rate of $15.94, labor costs in the state are very affordable. In addition, jobs have risen in the state by 11.73 percent. 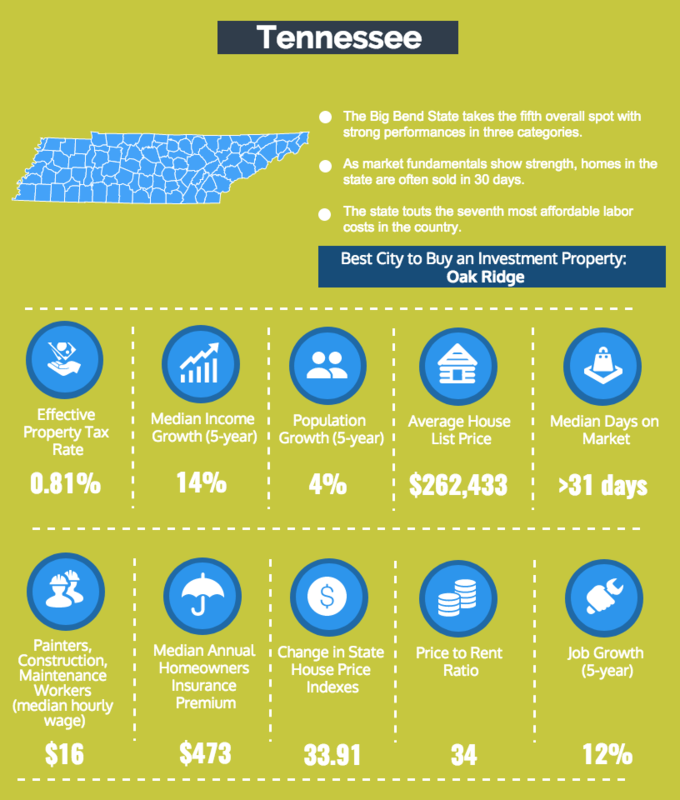 Oak Ridge’s housing market is one of the most attractive in terms of price and outlook. A median home value of $123,700 is relatively affordable. Home values have risen by 6.1 percent from last year. Experts predict that prices will increase by 3.5 percent within the next 12 months. Despite the recent fallout from Hurricane Harvey, Texas headlines the second half of our top ten list with strong performances in three heavyweight categories. More often than not, properties in the Lone Star State were off the market in less than a month. In addition, the population in Texas has grown by 8.64 percent over five years to rank second. The state also posts a notable ranking in job growth. The number of jobs rose by 13.28 percent since 2011 to finish tenth in this category. 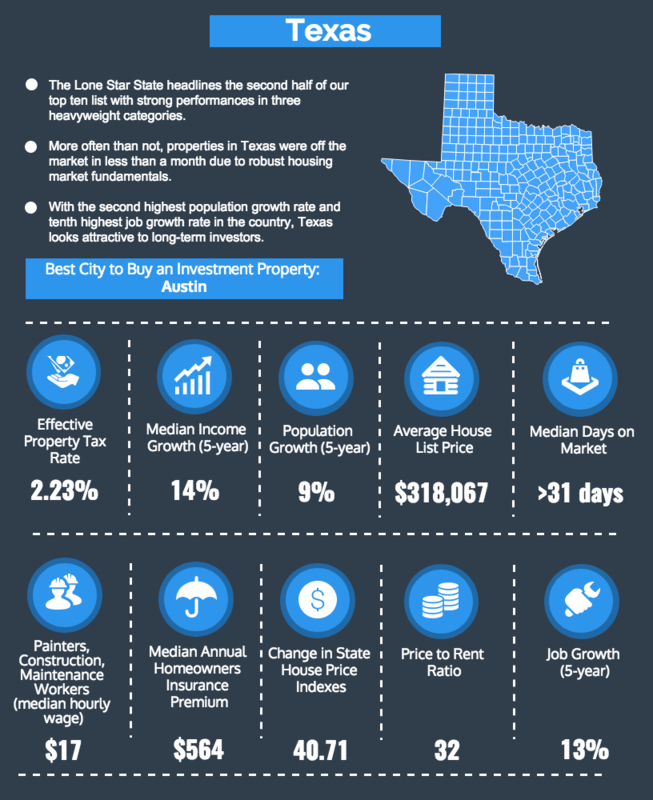 The capital of Texas is a good place to start a business, including for property investors. Home prices may be on the expensive side at $322,100, but residents can afford it because of the high median household income of $64,839. Home values are climbing, up by 7.1 percent over the past year, and the trend shows no signs of reversing anytime soon. Ranking within the top ten in three categories propels Arizona to seventh place in our rankings. 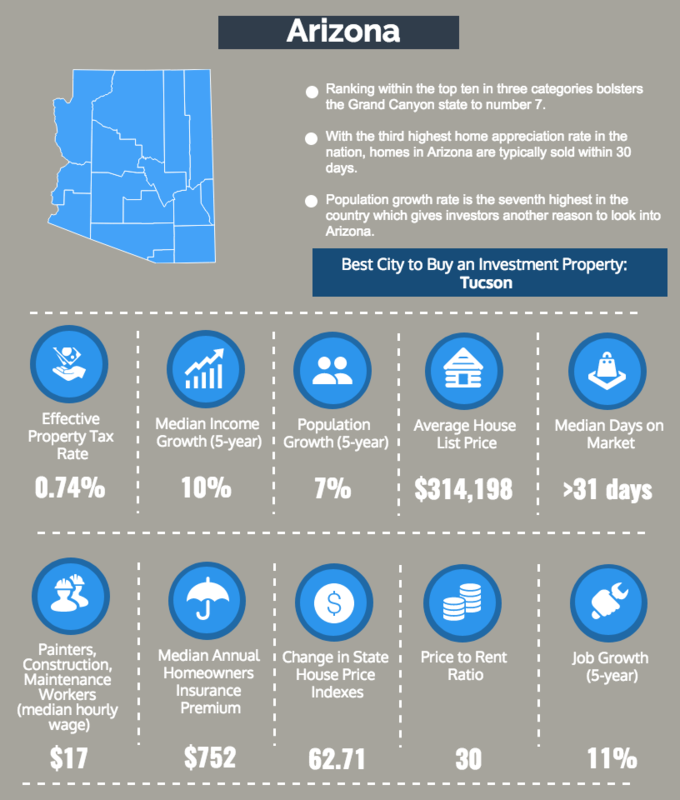 In most cases, homes for sale in Arizona are sold within 1 month. With a five-year HPI of 62.71, houses in the Grand Canyon State have the third highest appreciation rate in the nation. Arizona’s population is also on the up and up with a five-year increase of 7.7 percent. Tucson’s housing market was devastated by the housing bubble. The good news is the market has spectacularly bounced back. Home values have skyrocketed by almost 9 percent according to Zillow. The city’s median home price is $165,000. Experts predict that prices will climb by almost 5 percent within the following year. Looking at Tucson’s 10-year chart on Zillow, it appears that the city’s housing market has a lot of upside. 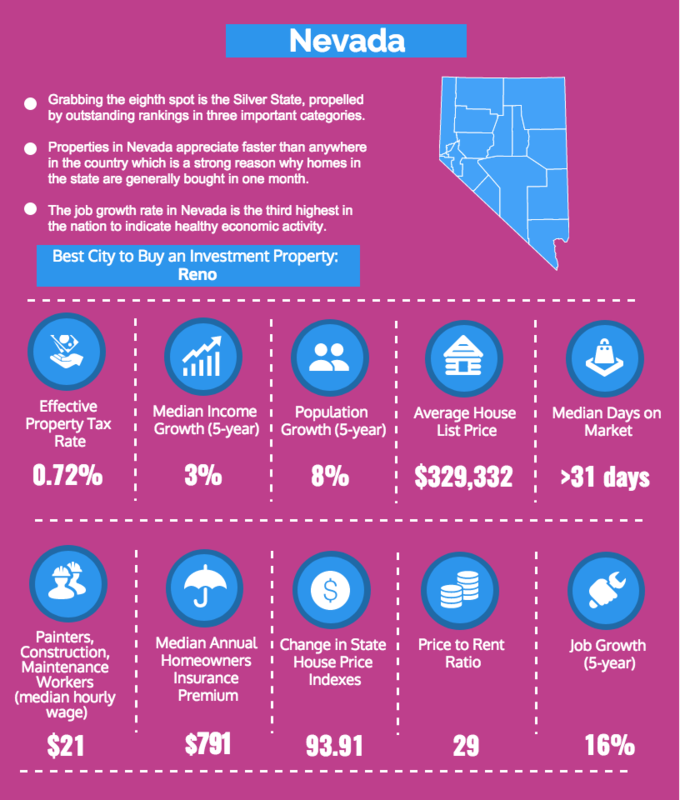 The Silver State grabs the eighth spot in our ranking, bolstered by excellent rankings in four categories. Listed properties in Nevada are typically off the market within 1 month. Furthermore, the state’s five-year HPI of 93.91 is second to none, which means properties in Nevada appreciate faster than anywhere else in the country. Also, the number of jobs increased by 16.17 percent since 2011, placing it third in that category. Reno’s housing market may be on the verge of a massive breakout after rebounding from its 2012 low of $153,000. Today, the median home value in the city is $318,000, which means the housing market has more than doubled in half a decade. Looking at technical indicators provided by Zillow, it appears that the market is on track to post impressive growth in the coming years. Three first place rankings carried North Dakota to number nine in our rankings. In North Dakota, homes that are for sale typically get sold in under 30 days. Median income has skyrocketed by 24.42 percent since 2010. Last, population is also booming; the state’s population grew 10.57 percent over a period of five years. 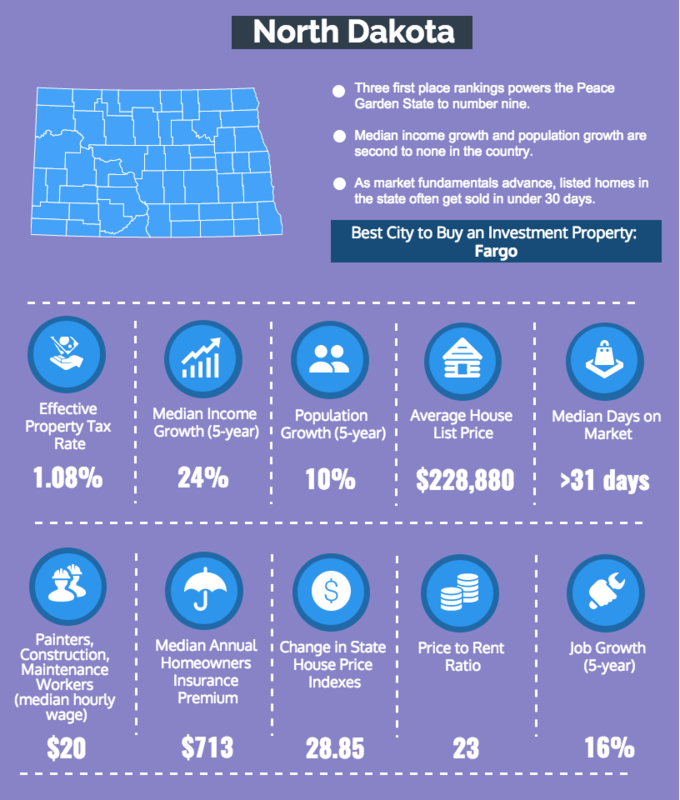 Fargo, ND has been hailed as the best city to survive a recession in North Dakota. 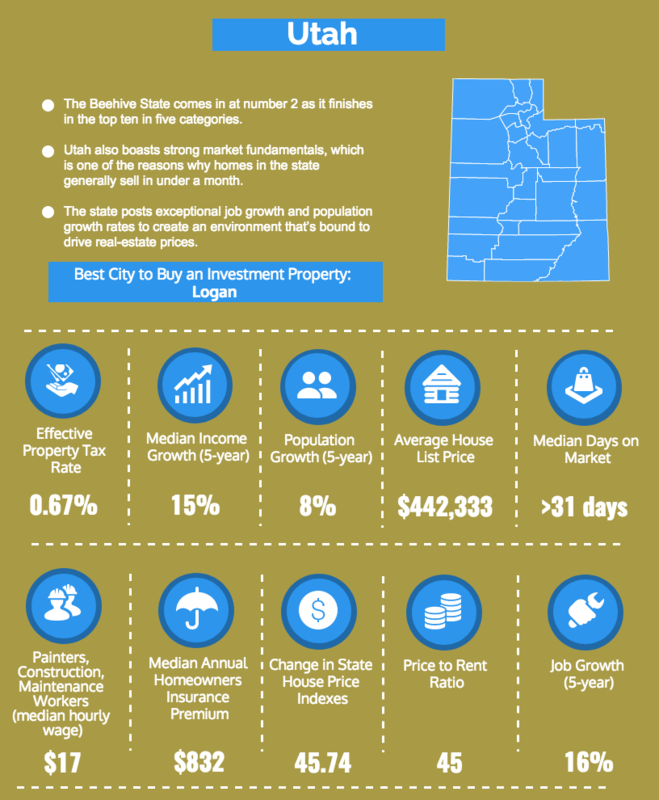 It is also the best city to buy an investment property in the state. While housing markets in Bismarck and Grand Forks have posted declines over the past year, Fargo’s market remains resilient despite the oil slump. Home values increased by 5.4 percent in the last year. A Zillow forecast shows that the city’s housing market will grow by 3 percent in 2018. Washington concludes our top ten ranking, bolstered by exceptional performances in three heavyweight categories. It only takes 30 days for most listed properties to get sold in the state. Jobs in Washington have increased by 16.325 percent since 2011 for a second place ranking in that category. In general, properties in the Evergreen State appreciate faster than in 43 other states, boasting a five-year HPI of 54.45. 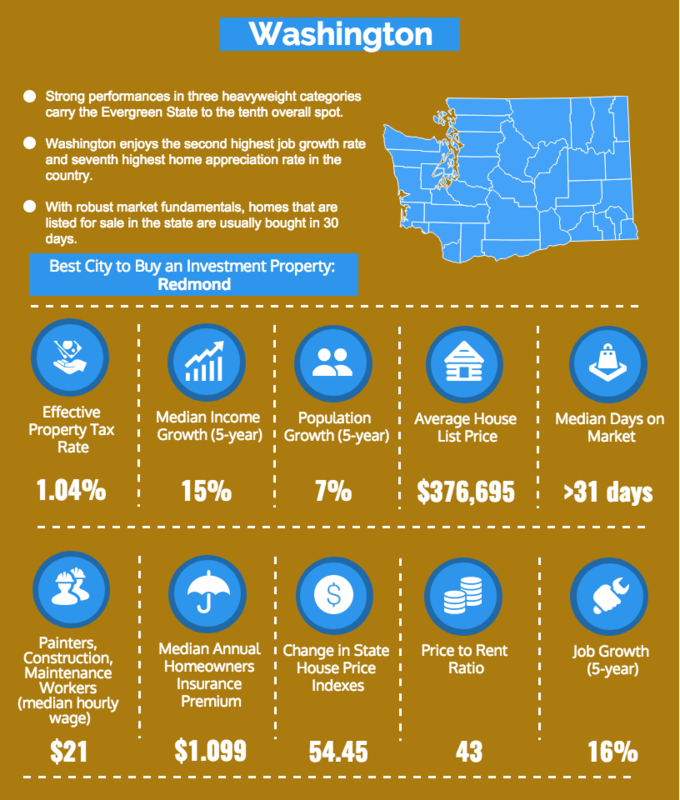 Home prices have appreciated in the state and Redmond is no exception. The median home value in the city stands at $795,600. Although prices are already off the charts, experts predict that the uptrend is not yet done. Zillow writes that values will increase by 8.5 percent within the next year as more tech companies put down roots in the city and people keep moving in. Thanks to Venngage for creating the infographics for each state above. To create great infographics and other visual media, try Venngage Poster Maker. We assigned the highest weight to this metric because buyers are more likely to take a mortgage and buy a home than pay monthly rent in areas with a low price to rent ratio. For this category, we took each state’s average listing price and divided it by the median annual rent in the state. It makes more sense to invest in states where the price to rent ratio is low. Home buyers also look into this metric to see whether it’s smarter to rent or purchase a home in a particular area. Let’s take West Virginia as an example. The median annual rent in the state is $9,840 and the average listing price is $173,190 to come up with a 17.6 Price to rent ratio. Given the relatively low price to rent ratio, it is better to buy a home because it will only take you 17.6 years worth of rent to completely pay off the property. On the other hand, it is better to rent in a state with a high price to rent ratio like Hawaii. At 47.60 price to rent ratio, it will take you almost 50 years worth of rent to completely pay off the property. If you are a landlord, that means it will take you a long time before you can get a return on your investment. Therefore, it is better to rent than to buy in a high price to rent ratio market. Real estate investors can look at how home prices appreciate or depreciate over time to see a trend. They can then use the trend as part of their analysis on whether investing in a particular area is profitable or not. To determine appreciation in prices, we used the five-year house price index (HPI) provided by the Federal Housing Finance Agency. The HPI is a measure of house price movement in the country. It is based on repeat mortgage transactions made on single-family homes. These mortgages were either bought or securitized by Freddie Mac or Fannie Mae as far back as 1975. The HPI may be used as an indicator of a trend in the state’s housing market. States with high HPI enjoy greater appreciation in prices than states with low or negative HPI. Accordingly, states with high HPIs received high rankings. If you’re looking to invest in a property and sell it later, you’d want to put your money in states where sell homes like hotcakes. We assigned this metric a high weight because investing in states where homes are sold quickly enables investors to recoup their capital plus interest. Even if you plan to hold onto your asset for some time, it’s preferable if you can sell a home quickly whenever you do place it on the market. Your profits can then be used to invest in other properties and expedite income generation. For this metric, we used data from properties sold between April – June 2017. For this metric, we tracked job growth for states over a period of five years. Economic activity is one of the strongest drivers of real estate value. We assigned considerable weight to this metric because growth in jobs points to greater economic activity. A state that has more job openings attracts both workers and investors. The influx of income-generating residents eventually drives real estate prices up. For this metric, we calculated median income growth over the last five years. Homes in states that placed high have more potential to appreciate in the next years. Residents of high ranking states have deeper pockets and are more likely to purchase properties, even at a premium, compared to residents of states of low ranking states. Like job growth, population growth also drives real estate prices up. States with higher population have more residents who can potentially generate income in the future. As the state’s population matures, the demand for commercial and residential spaces grows as well. For the category, we looked at the percentage of population growth for each state over five years. 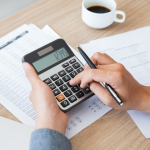 For long term investors, property taxes are part of the cost of holding the property until you decide to sell. And when the home is on the market, the property tax rate influences a buyer’s decision. On the other hand, states with low property taxes might be attractive to home buyers. To get the effective property tax rate, we divided the median real estate taxes paid by the median home price. The average listing price gives investors a rough estimate of home prices in a state. The data can be used to formulate an investment budget. The higher the list price, the higher the state ranked in our analysis. States that ranked high in this metric require a larger capital outlay but offer the possibility of more profits compared to low ranking states. Labor may come on top of home price for possible rehab costs. We gathered the median hourly rate for painters, construction, and maintenance workers in each state for this metric. Real estate investors should account for the cost of homeowner’s insurance and take advantage of states that offer affordable prices. The premiums impact an investor each month. Regional insurance requirements (e.g. flood insurance in coastal areas or earthquake insurance in earthquake zones) are more important, but there was no clear way to account for the regional variations in this ranking. We assigned low weight to this metric because annual homeowner’s insurance premiums are relatively inexpensive compared to other costs of owning a property. 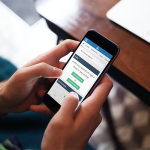 We relied on data provided by the National Association of Realtors (NAR). NAR publishes the Realtors Confidence Index which is based on a monthly survey transmitted to over 50,000 real estate professionals. The latest findings were according to data curated from April – June 2017. For this metric, we collected data from the Bureau of Labor Statistics. We tracked job figures at the state level from 2011 to 2016 to capture 5-year growth. We divided the average home value of each state by its annual median rent to get values for this metric. We collected data from Trulia, an online real estate site for buyers, sellers, and agents, to get the average list price of homes in each state for the week ending August 09, 2017. For median rent, we gathered 2017 data from the US Department’s Housing and Urban Development. States with a low price to rent ratio received higher rankings. For this metric, we relied on the latest data provided by the Census Bureau. We tracked each state’s median income from 2010 – 2015 to calculate 5-year growth. For this metric, we used the latest data provided by the Census Bureau. We compiled each state’s population from 2011 – 2016 to capture 5-year growth. The Bureau of Labor Statistics provided 2016 data on the median hourly wage for painters, construction workers, and maintenance workers. States that offered affordable labor received higher rankings. For this variable, we sourced data from Federal Housing Finance Agency (FHFA). FHFA provides the HPI, which is a measure of house price movement in the country. It is based on repeat mortgage transactions made on single-family homes. These mortgages were either bought or securitized by Freddie Mac or Fannie Mae as far back as 1975. States that posted high HPIs received high rankings. We got the latest data from FHFA which reports a 5-year HPI ending in the first quarter of 2017. To get each state’s effective residential property tax rate, we divided the median real estate taxes paid by the median home price. We use 2015 data, the latest available, from the Census Bureau. States with low property taxes got high rankings. For this metric, we collected data from Trulia for the week ending August 9, 2017. States with a higher average list price received higher rankings. Personal finance website Go Banking Rates provided data on annual homeowners insurance policy premiums. They relied on 2016 numbers provided by Zillow. States with costlier premiums received lower rankings in this category. Mountain West and Western states dominate our ranking. These states enjoy robust housing market fundamentals, and our research indicates that the uptrend will not reverse anytime soon. Unlike in 2008, the increase in home values is not driven by loose credit regulations. It is fueled by investments that boost economic activity. 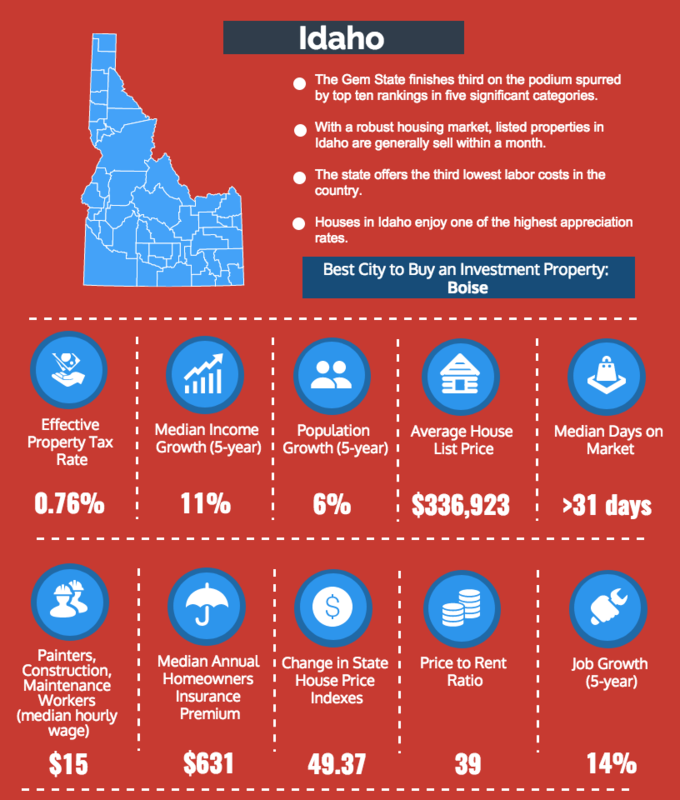 What are your thoughts about the results of our research on the best states to buy an investment property? Feel free to share your comments below.